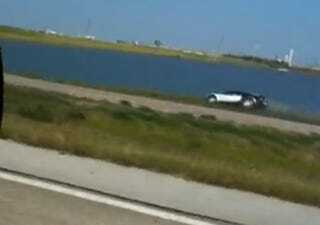 Remember the amazing $1.6 million Bugatti Veyron lake crash blamed on a low-flying pelican? We have the video of it happening and there's not a freaking pelican in sight. UPDATE: The driver responds! Yeah, that's not what happened at all according to this video. This was recorded by a Facebook user who appears to be taping it with a phone or digital camera just at the right moment. Warning, they do swear appropriately at the event. Incredible. I had dropped my phone, people dont know what happened, the arnold story was made up to by the wrecker driver. What it appeared to been was a reflection. We'll continue to cover this interesting story as it unfolds. UPDATE #3: We've finally put one and one together. Andy House not only crashed his Bugatti Veyron into a lake, he also owns the now-repaired Eddie Griffin-crashed Ferrari Enzo! UPDATE#4: Here's the full post-Lake Crash Bugatti Veyron mega gallery showing the aftermath.